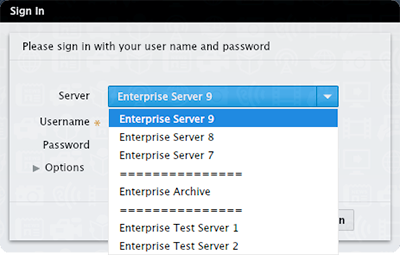 In order to use Content Station, it needs to be logged in to an instance of Enterprise Server. The Server to log in to can be chosen from the Server list in the Sign In window. Instances of Enterprise Server are added to the list by defining them between the <SCEnt:Servers> </SCEnt:Servers> tags of the WWSettings.xml file. When using this method, the WWSettings.xml file on each of the systems on which Content Station is installed needs to be updated each time a Server reference is added or modified.